How to practice the piano as a beginner. Learn essential tips and techniques to improve your own practice routine! Practising is essential if you wish to become a proficient pianist. Attending piano lessons plays certainly a large role in your piano education but it is not enough for you to make good progress. Lessons are offered for you to benefit from a wonderful guidance and structure, but your progress will principally take place during your personal practice sessions. If you wish to make your dream of becoming a proficient pianist become true, you must discipline yourself and dedicate at least 20 minutes a day to your piano playing, to start with. The amount of time spent at the piano will then increase at a more advanced level. As an adult, finding the time to practise daily can be daunting as we all have a busy life and numerous obligations. The best way to avoid being distracted and ensuring that your practice is done, is to do it on a set time each day, when you are the less likely to get disturbed. First thing in the morning works well, as fatigue after a long day at work, or an invitation to dinner cannot provide you with a good excuse not to practise your instrument! Learning how to play the piano is similar to learning a new language. You must practise it daily to make progress. Skipping a few days, thinking that you can make it up during the weekend will sadly not work well. It must really be done daily if you want to see any improvement. As having to play the piano each day is a new habit that you must include in your daily life, you could perhaps start by practising only 10 minutes and build up to 20 minutes. It is a good idea if you wish to get into this new habit easily! As a beginner, you could possibly feel lost and unable to determine how to use your time efficiently during your practice sessions. If your piano instructor did not explain it to you, do not hesitate to ask him or her, as being organised will surely make you save a huge amount of time. If your instructor has however given you all the information on how to practise, you should really follow his or her advice and not try to do it in a different manner. Your instructor is a professional pianist who has experienced various methods of practice and formed the correct opinion on the matter. Be careful not to fall into a famous trap which is to practise your piano piece so much that you neglect technical exercises and sight-reading. It is important to divide your practice sessions in equal parts to make even progress and become a well-balanced pianist. Being focused while practising is as important as being structured. For this reason, you must ensure to be at peace and not distracted by your family members when practising. Placing your piano in a quiet room is for example a much better idea than having it in the centre of the living room where your children play and watch the TV! Being focused will also save you an enormous amount of time and you will definitely make much more progress. Practising while thinking about something else does not work for anybody! As a piano beginner, your most important task is to learn how to read music. This step cannot be skipped and it should be your main focus until you can read all the music notes fluently. It is therefore important to spend a lot of time learning them. Once again, it is extremely similar to learning a new language. By doing so, you would add words to your vocabulary daily and repeat them until you remember them perfectly. It is the same with piano playing and learning the music notes. When practising a piece of the repertoire, repetition is key to your success. As a beginner, you are playing simple pieces that are easy to memorise. It is wonderful but it can create some issues in the long run. You could end up not reading the notes anymore and rely on your memory to perform them. For this reason, it is a fantastic idea to spend a lot of time reading music notes away from the piano and always do some sight-reading daily. All adults are a bit impatient when learning a new skill and tend to wish to run before they can walk! If you do not want to join the list of thousands of piano enthusiasts who sadly gave up after a few months only because they thought that it was taking too long for them to be able to play their favourite Chopin’s nocturne, you must remain patient and follow each step, without skipping any. 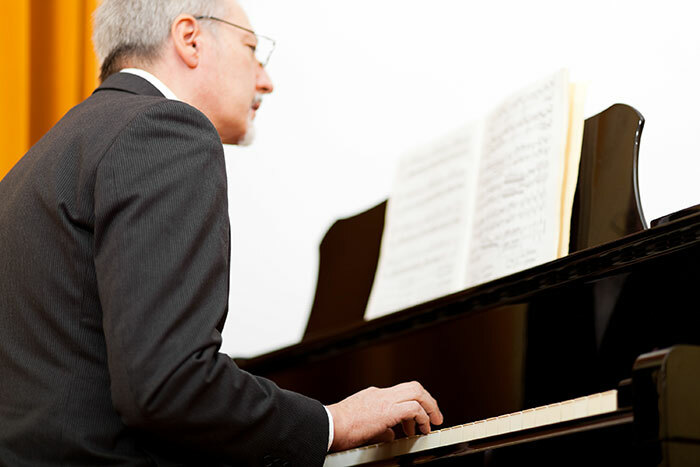 Becoming a proficient pianist takes time and there is no reason to be frustrated. Playing the piano is an art and a lifestyle. There is always more to learn and even the greatest pianists improve their skills until the end of their life. Do not measure it against time but rather see it as a pleasurable hobby. Often, adult beginners say that it is more difficult than they thought. Yes, playing the piano well is not as easy as it seems so take your time and enjoy each step! During your piano education, you will surely experience some up and down periods. All pianists have gone through frustrated times. It is absolutely normal as learning how to play the piano is unfortunately not a straight road to the top! Depending on the day or the week, you might sometimes feel happy and encouraged. On some other days, you might wonder why you are not able to perform as well as the previous day. Do not worry as it is a part of the process. Just do not give up and do not get frustrated with yourself, especially while practising as being stressed and nervous is definitely detrimental. It does not help you play better! On the contrary, it makes it much worse. If you ever feel annoyed with yourself during a practice session, stand up, have a glass of water and only return to the piano when you have calmed down. You will see that it is much easier to play the piano when you are serene! Celine Gaurier-Joubert is a concert pianist and one of the world’s leading expert on piano education for adults. (Specifically for amateurs, absolute beginners and adult piano lovers playing for their own pleasure). She studied with the grand master of piano in Paris, Edson Elias who was a student of a student of a student of Franz Liszt. She has also studied Marie Jaëll’s method’s extensively. This has led her to develop a magnificent tone on the piano by touching the piano’s keys in a very specific manner to produce the warmest tone possible on the piano. Learn how to practice the piano as an absolute beginner and how to make great progress!